On March 11 2013 a M4.7 earthquake occurred in the Anza section of the San Jacinto fault (SJF) zone (Figure 1). The event was typical for the region, it occurred at a depth of 13.1±0.5 km and the focal mechanism indicated strike-slip motion on an 82° dipping fault. 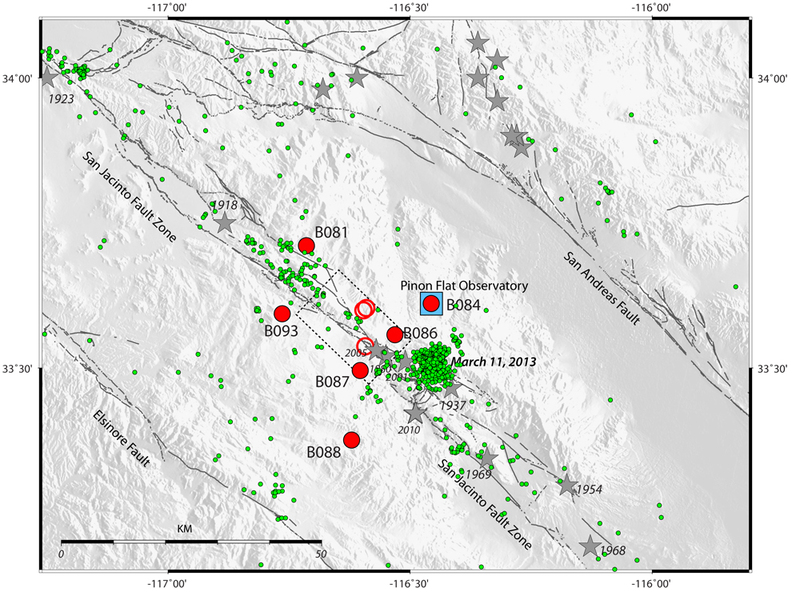 However, in the weeks following the event, data recorded by several Plate Boundary Observatory (PBO) borehole strainmeters (BSM), and by long baseline laser strainmeters at the Pinon Flat Observatory (PFO, operated by UC San Diego) indicate that the moderate sized earthquake may have perturbed the regional strain field along this section of the fault zone (Figures 2 and 3). The San Jacinto fault (SJF) is one of three major faults that comprise the San Andreas fault system in southern California (Figure 1). Combined, the San Jacinto, Elsinore and southern San Andreas faults are believed to accommodate as much as 80% of the Pacific-North America relative plate motion in southern California (Fialko, 2006). Although the SJF has a much slower slip rate than the southern San Andreas, 12-22 mm/yr compared to 23-27 mm/yr, 11 earthquakes of M>6 have occurred along it since 1890, making it one of the most seismically active faults in southern California (Wdowinski, 2009). The Anza seismic gap is a 20 km long relatively seismically quiescent section of the SJF zone centered between the 1918 M6.8 San Jacinto and 1968 M6.8 Borrego Mountain earthquakes. The region forms a natural laboratory for studying the accumulation of strain within a plate boundary zone, the transfer of stress between faults and the measurement of strain accumulation around locked fault patches. 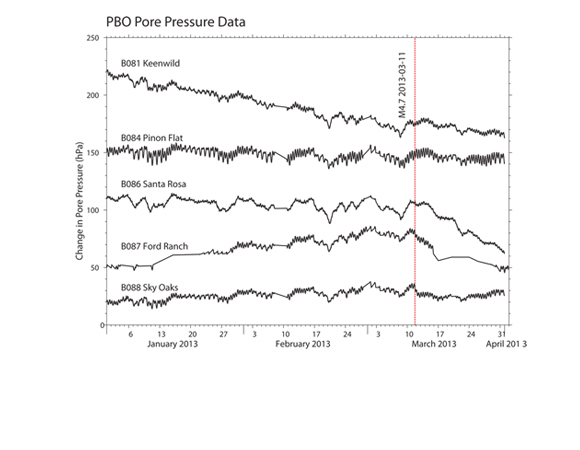 PBO operates a network of 9 BSMs and 8 seismometers within the Anza region. BSM B084 is installed at PFO, the long running site of some of UC San Diego’s long baseline laser strainmeters. Figure 4. 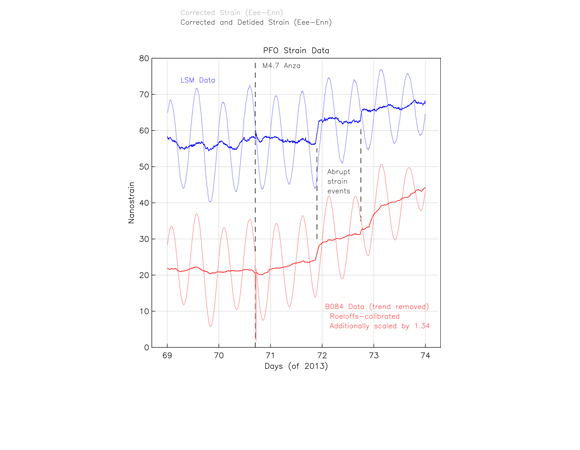 Both the borehole and laser strainmeters at PFO detected small strain events on the 12th and 13th March 2013. 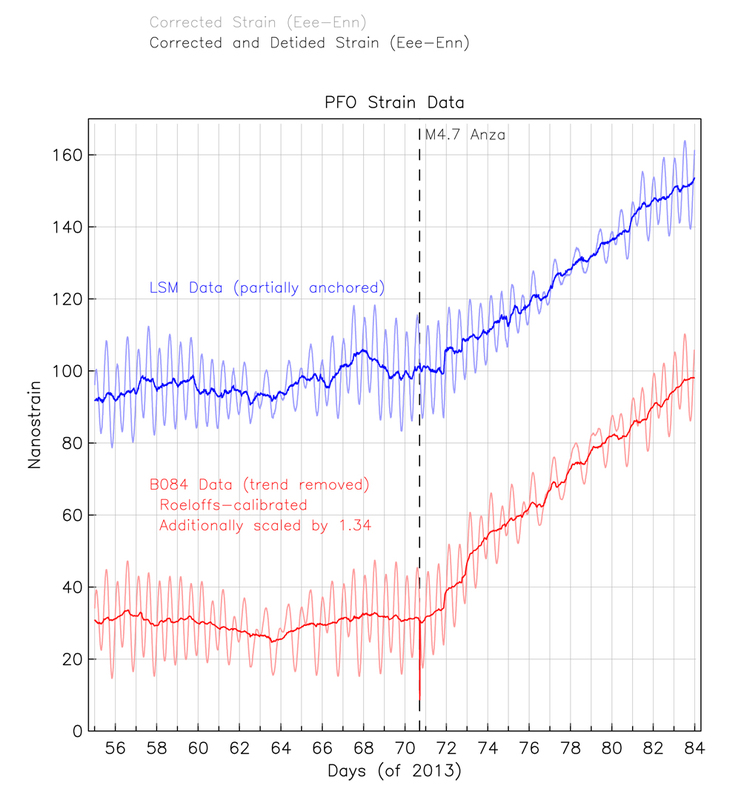 Figure prepared by Billy Hatfield Scripps Institution of Oceanography, University of California San Diego. Figure 5. 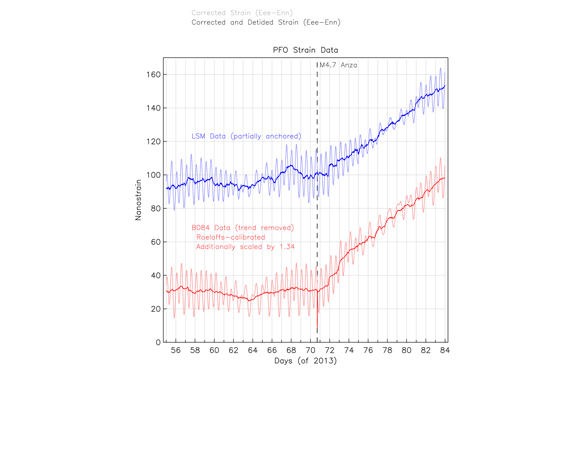 Pore pressure data collected in PBO boreholes. 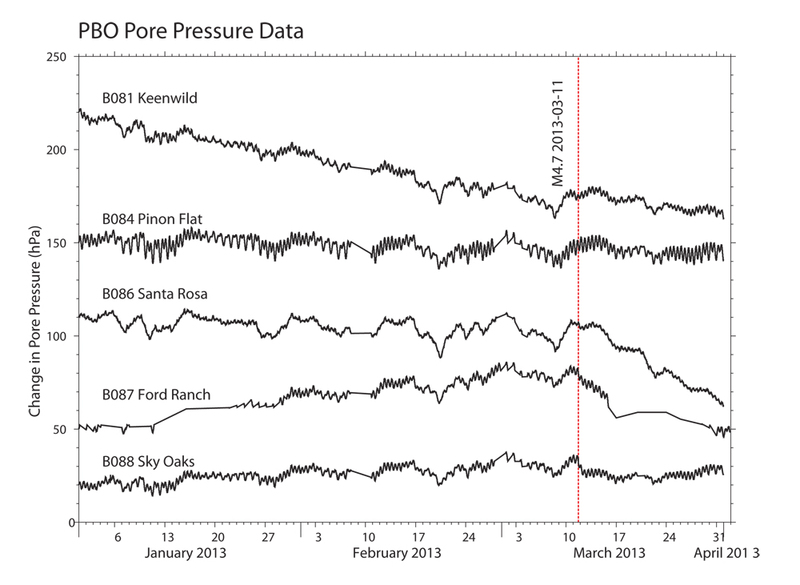 Plot indicates change in pore pressure since 2012-01-01. 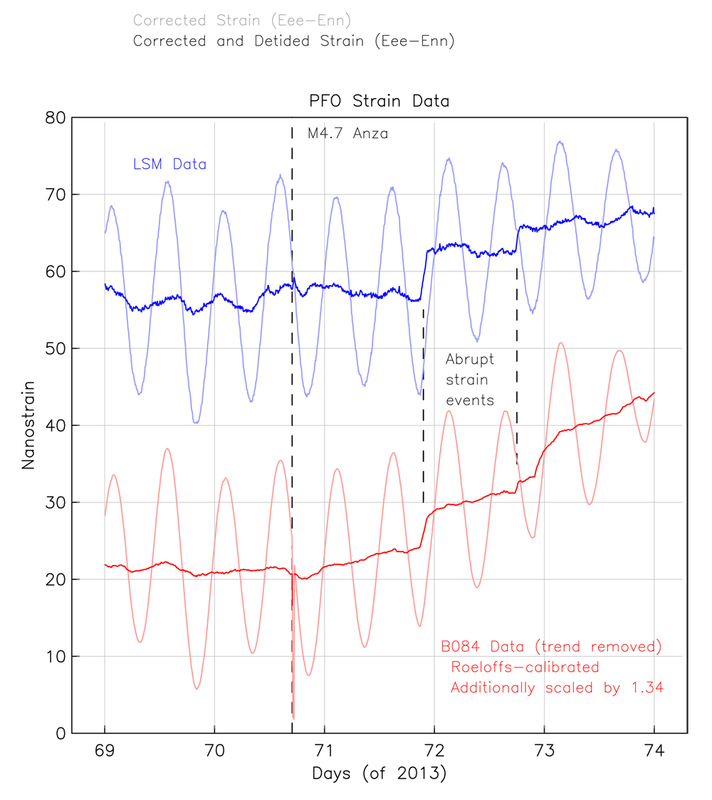 Since the March 11th event, the PFO long baseline laser strainmeters, and B084, have recorded consistent strain transients indicating fault parallel shear strains of ~60 nanostrain in the subsequent two weeks. 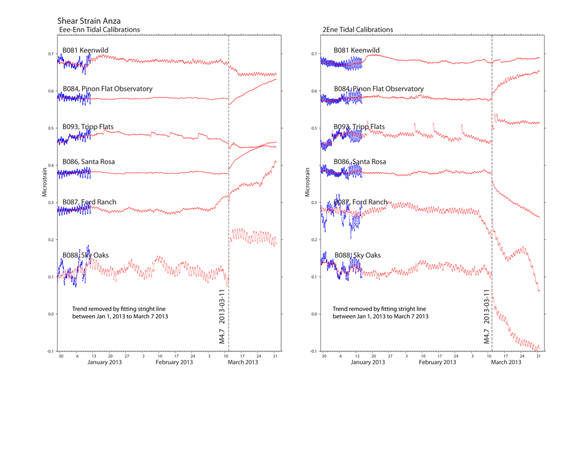 Both strainmeter systems recorded two smaller postseismic events on March 12th and 13th (Figure 4). 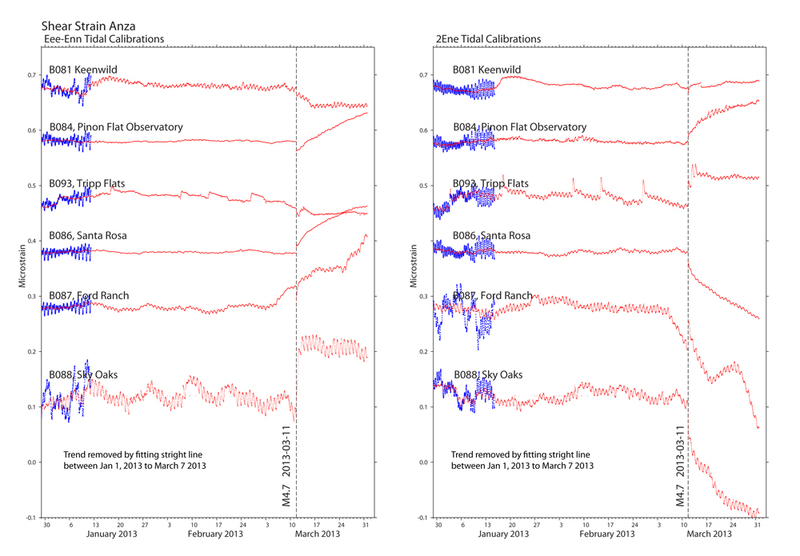 The cumulative magnitude of the signal, ~0.6mm/10km over 2 weeks, is well below the noise level of GPS. Possible causes for these anomalous strain transients are the redistribution of pore pressure throughout the region following the M4.7 (Figure 5) or aseismic slip at depth on a strand of the San Jacinto. Fialko, Y., 2006, Interseismic strain accumulation and the earthquake potential on the southern San Andreas fault system, Nature 441, no. 7096, 968–971, doi 10.1038/nature04797. Wdowinski, S., 2009, Deep creep as a cause of excess seismicity along the San Jacinto Fault, Nature Geosciences, 2, 882-885, 2009.